Around the world, American basketball is the “cool” sport to global youth; for America’s inner-city minorities who both fight for a shot at equality and a spot in “the League,” the sport means so much more. Toronto artist Esmaa Mohamoud, known as “E” in the art world, tackles that complexity of basketball culture with her first solo exhibition, #000000 VIOLENCE, symbolizing a call for peace on all fronts within the Black community. 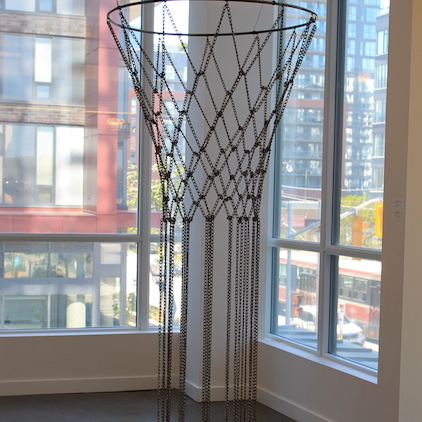 With installations of large-scale chain hoops and 60 concrete basketballs inspired by 1994 documentary Hoop Dreams, among other features, E uses gritty industrial materials to convert realism into a new-age, interactive art experience. E thinks artists have a responsibility to the public with their work’s message. The pure concrete basketballs she made each weigh 30 pounds, 1800 pounds all together. 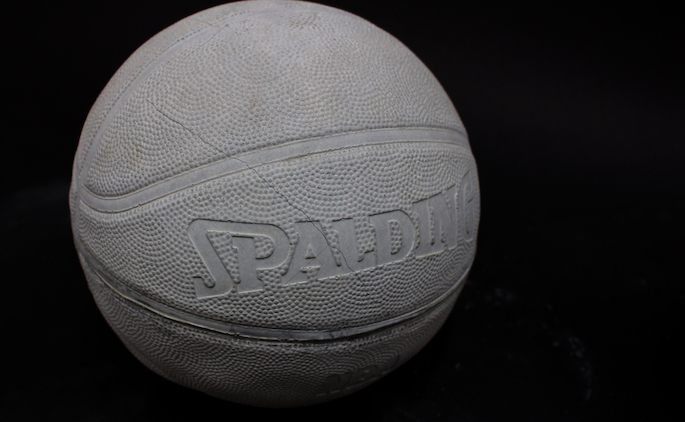 “It’s not enough to make a basketball look heavy; it has to actually be heavy.” E made 60 balls because of its significance as the ending number in the second round of the NBA Draft. “If someone comes up in my show and asks to lift one up, I want them to understand that this is the reality and the gravity of what failed hoop dreams look like, you know? This weighs heavy on a lot of people. I could take a basketball, spray paint it, and cover it with concrete, but that’s not enough to me because that basketball’s still light, you know? I can still lift it and throw it. Nobody’s throwing a 30-pound basketball,” she says. Although she loves basketball, she actually can’t play. With E’s art, it’s more about the experience than the aesthetic. While she is greatly influenced by hip-hop, hip-hop also shows the love back. College dropouts don’t always equate to art excellence—sorry, Mr. West.